New Pornographers, like Spoon, are dependable. Their newest release Brill Bruisers, is just another album in a line of consistently good albums from the Canadian power-pop group. There are a lot of very catchy songs. The band starts with that signature New Pornos lushly collaborative sound and takes it to another level. Neko Case takes lead vocals on some of the songs. Carl Newman takes lead on other ones. Dan Bejar sings lead vocals as well. They help each other out with backing vocals and “lah-lah-lahs” when required. My favorite song was “Champion of Red Wine.” It seems to be about experiencing life to the fullest. Case sings, “I think we could save lives/ if we don’t spend them/ way undercover.” “Dancehall Domine” was reminiscent of “Twin Cinema” (from 2005’s Twin Cinema). Brill Bruisers is not largely different from their other albums but there is a lot to be excited about. There are moments of joy. It is retro and new at the same time. It a heavier version of their normally dreamy sound but it doesn’t feel forced. 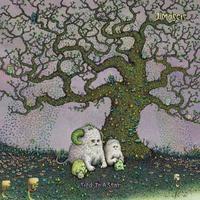 J Mascis‘ Tied to a Star came out this week. It is the follow up to Several Shades of Why, his folk rock solo debut released on Sub Pop in 2011. I was not familiar with his last solo album but I was immediately drawn to Tied to a Star. It is similar Dinosaur Jr’s 1987 album You’re Living All Over Me. The songs harness my favorite aspect of Dinosaur Jr: the stripped-down part. This is the kind of album where it is easy to get caught up in the aura of the melodies. By pairing those acoustic melodies and a tiny bit of fuzz, the album conveys a subdued and mellowed Mascis. Tied to a Star is recommended for those who enjoy a mix of exquisite acoustic melodies and heavyhearted lyrical themes.